Usually distinguished from African Yellow White-eye by its greyish underparts and green (not yellow) upperparts. 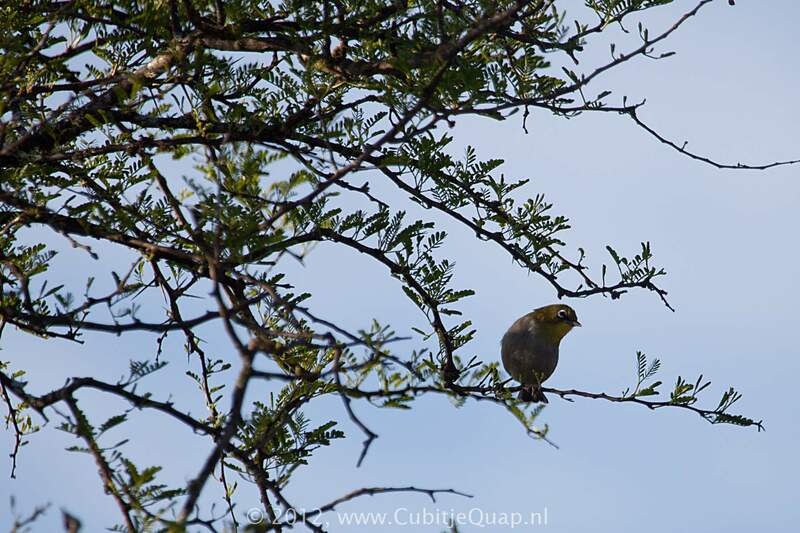 However, birds in Mpumalanga have pale green almost yellow backs; here, only the greyish green vent and greenish (not yellow) head differentiates this species from African Yellow White-eye. Lacks the obvious buff sides to the breast and flanks of Orange River White-eye. Forests, woodland, savanna, exotic plantations and suburban gardens. This bird feeds mainly on insects but also soft fleshy flowers, nectar, fruit and small grains. A soft, sweet 'tweee-tuuu-twee-twee', often repeated.